Citation (APA Style): Stapleton, P., Sheldon, T., & Porter, B. (2012). Clinical benefits of Emotional Freedom Techniques on food cravings at 12-months follow-up: A randomized controlled trial. Energy Psychology: Theory, Research, and Treatment, 4(1), 13-24. This randomized, single-blind, crossover trial tested whether participants who used Emotional Freedom Techniques (EFT) maintained reduced food cravings after 12-months and updates previously reported 6-month findings. Ninety-six overweight/obese adults were allocated to a 4-week EFT treatment or waitlist condition. Degree of food craving, perceived power of food, restraint capabilities, and psychological symptoms were assessed pre- and posttest and at 12-month follow-up for collapsed groups. Significant improvements occurred in weight, body mass index, food cravings, subjective power of food, craving restraint, and psychological coping for EFT participants from pretest to 12 months (p < .05). It appears EFT can result in participants maintaining reduced cravings over time and affect weight and BMI in overweight and obese individuals. Have you ever worried that you sabotage your relationships? Or that you unconsciously drive people away? 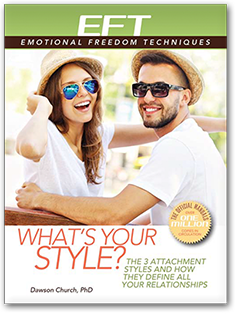 Find out what your personal attachment style is and take the quiz with this special report! 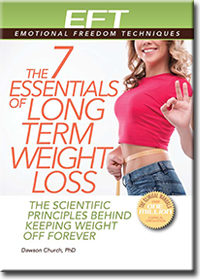 A small percentage of dieters succeed in keeping weight off permanently. Learned simple yet specific behaviors that keep you healthy! Note: This content assumes you have a working knowledge of EFT. 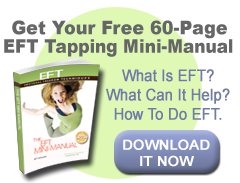 Newcomers to emotional freedom techniques, also known as EFT, Tapping, and EFT Tapping can still learn from this content, but are advised to get the EFTUniverse Free EFT Get Started Package and/or EFT Books and/or attend EFT Training Workshops for a more complete understanding of EFT. For more information, please read the EFTUniverse EFT Information and Disclaimer Document.